The Department of Environmental Affairs (DEAT) has finally given the go-ahead to breach the Seekoei River mouth and the breaching will start this morning, 30 September. Breaching the mouth will help to lower the water levels of the estuary and clear the causeway that connects Paradise Beach to Jeffreys Bay. The causeway has been submerged with water for more than a month following unusually high seas in August. 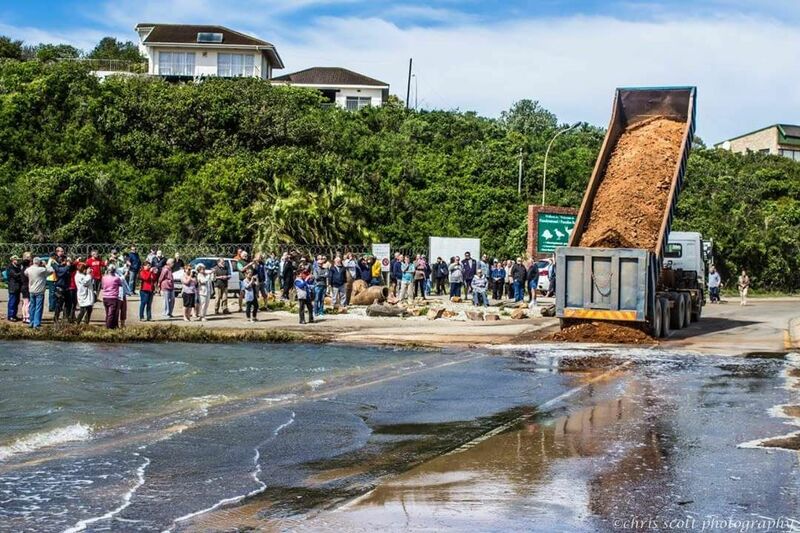 This comes after a few days earlier DEAT refused to allow the estuary to be breached, resulting in the municipality closing the causeway two days ago on 28 September as it considered it unsafe. The closure resulted in a huge outcry from residents in Aston Bay and Paradise Beach who invited media, including national organisations, such as such as SABC and Carte Blanche to publicise their plight. Residents complained they were trapped and had to use bad gravel roads as detours and travel at least 20 extra kms a day, causing hardship for residents. The SABC and other media took photos of the road being barricaded and broadcast and published the residents’ complaints over the past two days.